Back home in Bayou Bend after the death of his fiancee, contractor Chase was hired to restore the town’s old theater. From the blurb, I expected him to be a risk taker, but he wasn’t that way at all. He was steady and kind, quite the hero, coming to Stella’s rescue several times. Recently divorced Stella, a preacher’s daughter and ex-pageant queen, is trying to make a living as an interior designer, but will soon be evicted if she can’t work with Chase on the theater’s design. She hides her pain behind a fake pageant smile, baggy jeans, and no makeup. I could relate to Stella’s feelings of inadequacy and loss of self-esteem from divorce. The cover is stunning, a perfect match to the inside! The writing was exceptional. The author dug deep into relationships, and this book was so much more than a romance. It’s about people and pain, and how we hide it, and how a person so broken can find their beauty or, in Stella’s case, her “colors” again. It’s about loving people through their brokenness. The story kept me flipping pages, but some threads just didn’t come together as neatly or as satisfying as that last piece in a jigsaw puzzle. 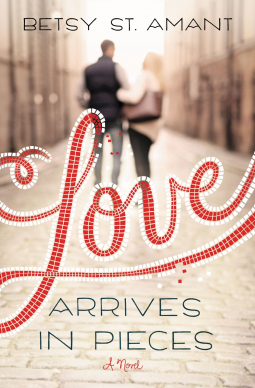 As the title implies, Love Arrives in Pieces seemed a bit fragmented, but maybe that’s by author design. Check out Love Arrives in Pieces and give it a read. Guest review contributed by Fiction, Faith, and Foodies. Along with writing about dinner cuisine and articles about faith, Dora reads and reviews books. Check out the newest book review from the Book Review Directory! Next Post Updates and Announcements!